I’ve written about the IDF before – when my daughter handed a chayal (soldier) a flower and in a post highlighting our chayalim bodidim (lone soldiers). Yesterday a friend shared a video (on Facebook, of course) about another type of chayal and I was so taken by it that I have to share with you, too. I was aware that the IDF integrated disabled young teens and adults into the army but was not aware of the scope of this project until I watched the video. Whether or not one is actually serving in the IDF, it still plays a major part in the life of most of us living here in Israel just because of the ubiquitous presence of soldiers in uniform, many traveling with a giant backpack and a gun slung over their shoulder. In the U.S. a soldier in uniform is a rare sighting; here it is an everyday occurrence. It is so much part and parcel of life in Israel, and a right of passage for many, that until recently young adults with developmental and/or physical disabilities felt very left out not being able to serve alongside their peers. In 2001 Maj. Col. (res.) Ariel Almog changed the reality for the disabled when he initiated the ‘Great in Uniform’ project enabling them to serve their country. They are part of the Israeli Defense Forces for three years providing valuable service. At the same time they gain important skills and receive needed support and guidance so that they can lead independent lives in Israel after they are discharged. Almog, who was seriously wounded preventing a suicide bomber from perpetrating an attack as well as taking out his accomplice, spent two and a half months in the hospital. While there he saw many disabled young adults and it occurred to him that they deserve an opportunity to serve their country just like everyone else. When he returned to duty he initiated project ‘Great in Uniform’. Lt. Col. Almog’s spirit, passion and ongoing care are an inspiration to everyone involved with the organization. A man whose incredible bravery on the field of battle is well known, and who’s bravery off the field of battle in taking on this important mission is just as impressive. 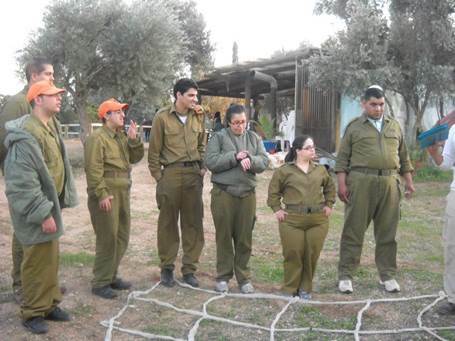 The project enables young Israelis with disabilities to perform significant supportive and productive tasks as part of IDF service. Today we are proud of the IDF not only for its military achievements at home and humanitarian accomplishments around the world, but also because it provides a shining example of what a little bit of caring can do to improve the lives of our developmentally and/or physically disabled brothers and sisters. Donations can be made by clicking here. Within the course of several days I read three interesting articles regarding Israel that I thought merited sharing. One of them bothered me very much; I thought it deserved comment because it was rather unfortunate that an orthodox Jewish college student is taking up the mantra of left-wing anti-Semites; the other two, because they show Israel for what it is – a state built upon Jewish ethics and caring, and a land which has been waiting for Israel, it’s rightful owners, to return. … I wish I could ignore painful articles about price tag attacks and settlers shooting Palestinians, and simply write to American politicians and newspapers about Israel’s commitment to the security of its citizens, its medical and technological advances and aid to third world countries. But I can’t. … But even one racist slur is a problem, even one unprovoked price tag attack damages Israel’s claim to have the moral high ground in its relations with Palestinians. And when it is not just one racist slur, but many, not just marginal extremists involved in the melee, but Knesset ministers, it becomes harder, even for someone with a deep love for Israel, to advocate for Israel as the most democratic country and most stable American ally in the Middle East. As someone who loves Israel deeply, this trend is extremely saddening. In addition to coming to visit, working in and studying in Israel, I want to be proud of Israel, too. The next article in Mishpacha Magazine’s January 9, 2013 issue, titled “Open Hearts in the War Zone” presents the perfect juxtaposition to Atara Siegel’s piece. It shows the true nature of the Jewish State and the Jewish people – and makes me really proud of Israel and her wonderful people! Taking cover as Iron Dome swings into action. For 1,800 years it seemed unlikely that Israel would ever be reborn. No nation in history had ever been regathered after such a lengthy period. Even the Hebrew language was lost in that time. Meanwhile, the Promised Land became a barren wasteland – a desert no man could master. Have you ever wondered why the Holy Land became a wasteland during the 1,800-year dispersion of the Jews that lasted until they returned in significant numbers beginning in the early 20th century? Have you ever wondered why Mark Twain was so disappointed at what he found in his travels through the area in the 19th century? Have you ever wondered why, during that period of nearly two millennia, no other people successfully and permanently settled this land that is so much in dispute today? It was all a fulfillment of prophecy. Little did Mark Twain know when he wrote about his trip to the Holy Land that he was fulfilling prophecy, but he was. It wasn’t just the children of Israel who suffered as a result of their disobedience and apostasy. So did the land itself. 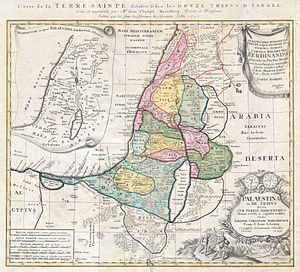 In his book, “Prophecies for the Era of Muslim Terror,” Rabbi Menachem Kohen points out the land suffered an unprecedented, severe and inexplicable (by anything other than supernatural explanations) drought that lasted from the first century until the 20th – a period of 1,800 years coinciding with the forced dispersion of the Jews. Once I wondered what happened to Israel to turn it into the dusty, arid land it was when the Jews came back in the 20th century. Until I read that prophecy in Deuteronomy, brought to my attention by Rabbi Kohen, I had no clue. I decided to check this out as best I could and examined the rainfall data for 150 years in Israel beginning in the early 1800s and leading up to the 1960s. What I found was astonishing – increasing rainfall almost every single year – with the heaviest rainfall coming in and around 1948 and 1967. Is this just a coincidence? Nor do I think Israel can continue today to make bad stewardship decisions regarding the land bequeathed to the Jews by God without consequences – serious consequences. That’s why I believe in climate change. But it’s not the imaginary kind caused by carbon dioxide. It’s caused by the Creator of carbon dioxide – and everything else. He’s still got a plan for this land of Israel. And He is absolutely intolerant of anyone or anything that interferes with it. And considering the tremendous amount of rainfall we had here in Israel just this past week, I would say that G-d is still on our side (even if Atara isn’t). I would just like to remind Atara of two things: (1) even our patriarchs, matriarchs, and greatest leaders like Moshe Rabeinu (Moses) and Dovid Hamelech (King David) were not perfect and (2) of the sin of the spies’ (Numbers ch. 13-14) derogatory report about the land of Israel and the aftermath. 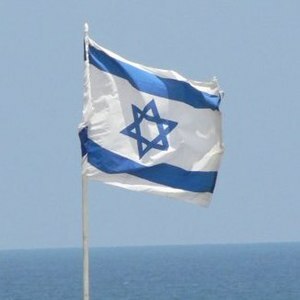 As for me, I’m a proud Jew, proud of the Jewish people in the Land of Israel, and honored to be living in our land. Making aliyah is a process, from the decision to make aliyah to the actual move, to learning the ins and outs of how to make a life here, and everything in between. Spiritually, the blessings of living here are incomparable, but culturally and materially, some things are better, some are not, and some are just different. What I’ve learned along the way is that while we get used to different ways of doing things, we must not idealize what we left behind because we could be wrong. It’s important for American (and all olim) to discuss these issues and get feedback in order to negotiate the aliyah, but a U.S. reality check is important too. “Listening” to what people are opining on various aliyah forums brought this home to me. At times rather extended conversations take place regarding the pros and cons of different aspects of life in Israel. Earlier in the year the conversation was about the cost of living in Israel, spurred on by the “cottage cheese” boycott and Globes magazine’s articles about the high cost of many products in Israel, which I blogged about here. A recent toshav chozer (a citizen returning to Israel after many years abroad) to Haifa contributes frequent updates about his varied experiences and concerns. The most recent debate centered around whether making aliyah is too difficult. The wonderful stories that people contributed about their “only in Israel” and “WOW” experiences here, despite any hardships encountered, actually helped one olah convince her mother to make aliyah. Caryn, take a look if you can at an article in yesterday’s Wall Street Journal (“Oldest boomers in U.S…..) about one of the items you mentioned last Shabbat — the difficulties of older workers in finding employment. It confirms your opinion. That it does. The complete title of the article written by E.S. Browning, Oldest Baby Boomers Face Jobs Bust, is telling. Older people have more trouble finding new jobs. Among unemployed workers older than 55, more than half have been looking for more than two years, compared with 31% of younger workers, according to the Heldrich Center. Among older workers who found a new job, 72% took a pay cut, often a big one, the Rutgers data show. The problem has been building for decades: Inflation-adjusted, middle-class incomes have stagnated in parallel with a free-spending culture of indebtedness that has left many Americans with too little saved. Over the same time, many U.S. companies cut pensions and shifted to less-generous retirement-savings plans such as 401(k) accounts that have stagnated or diminished in the market tumult of past years. Older families aren’t just failing to save, they are increasingly draining accounts that were supposed to help finance retirement. Flex-Pay>> Fortune advises job applicants over 50 to preempt age issues. Turn age into an asset by emphasizing experience; describe your flexible management style to deflect fears that you’re too set in your ways; cite experience working successfully with a younger boss to allay that common concern. 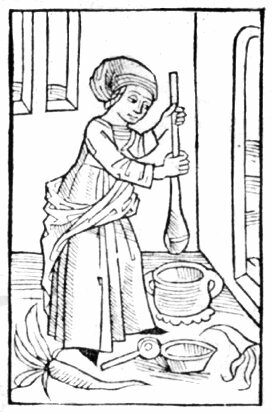 And by this stage in your life, it is often wise to keep in mind that it sometimes pays to be flexible about pay. The discussions we have are important in helping us acclimate to a new situation. However, it’s important to remember that no matter where we are, there will always be some challenges for us to deal with; if it’s not one thing, then it’ll be another. In many respects, the situation in the U.S. is no longer the one we actually left behind — nor some rosy one we’ve painted in our imaginations. Having made the effort to pack up our belongings and move halfway around the globe for a more fulfilling and meaningful life, it’s important to do a reality check and not let false perceptions sour our experiences. The sooner we recognize this, the easier it will be to accommodate a new reality and find creative ways of overcoming these challenges. Just ask Yonatan. Menorahs make your heart so light! Sufganityot* make the sun shine bright! Celebrating the Jewish holidays in Israel is a very different experience than observing them in the States because here the whole country is celebrating with you. I’m not sure how long the WOW factor lasts after aliyah (it’s almost 1 ¼ years for us) – I hope it never goes away – but I’m still amazed and delighted that what used to be for me a communal event is a national celebration here and I’m part of it! Even Billboard Magazine gets into the Chanukah spirit! 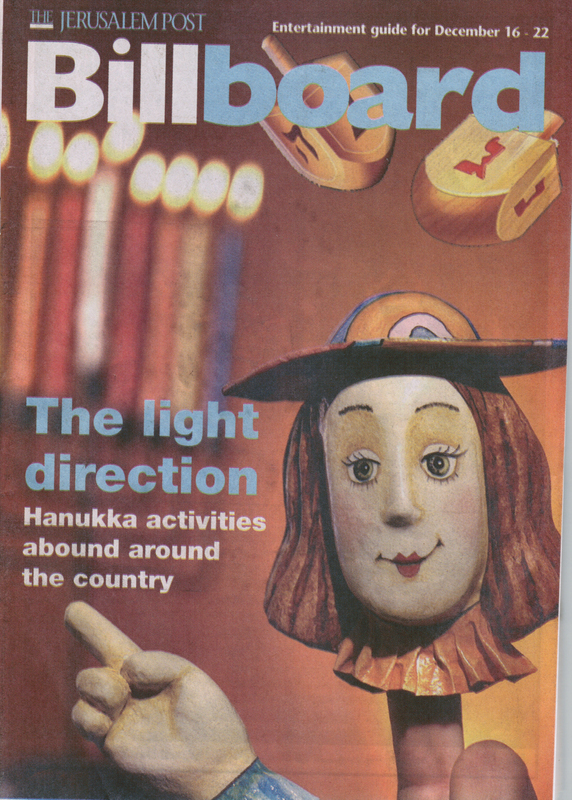 Chanukah even ranks top in the Jerusalem Post’s Billboard Magazine; full of movie, TV, and entertainment listings, Chanukah gets the front cover and the magazine features a variety of Chanukah events taking place around the country. And, it’s the only holiday which takes front and center at this time of year! 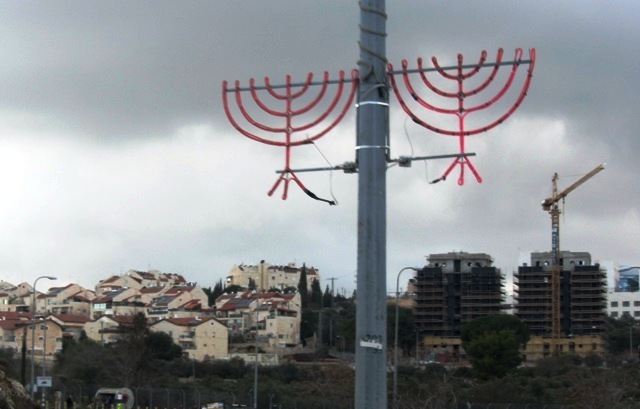 but the Chanukah season in Jerusalem is very consistent. 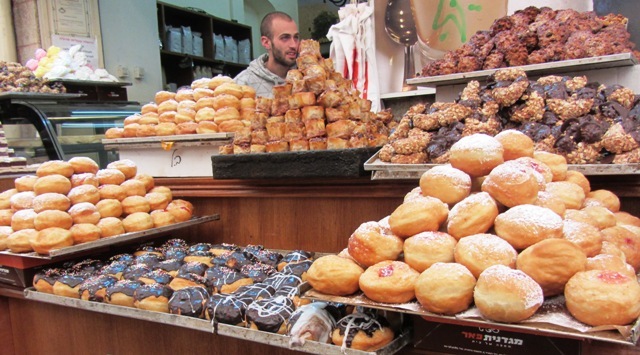 There are 10 sure signs that Chanukah is on its way. 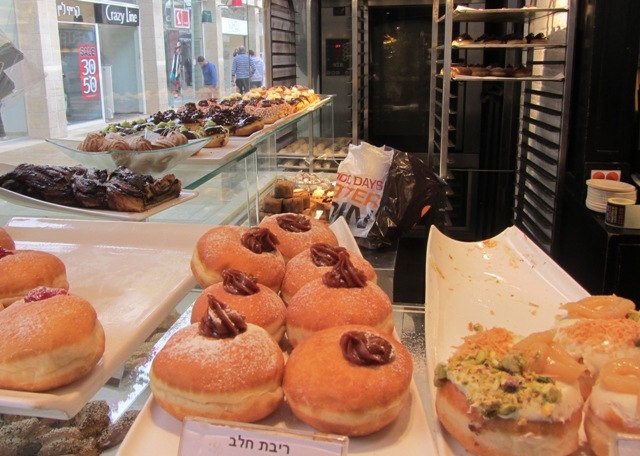 Click here for 8 more signs that Chanukah is coming to Jerusalem. Answer to question above – When we pour water from one container into the next, all the water is transferred; however, when we pour oil from one container to the next there is always some that remains behind. So, even though the oil in the jug was enough to burn for one night, when it was poured into the Menorah some oil remained in the jug. Therefore, there was not enough oil in the Menorah for even one night. The fact that the Menorah stayed lit that first night was a miracle as well!